범죄 위험을 예방하기 위한 다양한 시도가 이루어지고 있다. 옥외활동 하는 보행자들이 범죄자들의 공격을 받는 경우 중의 하나는 비정상적인 건강상태이다. 술에 만취하여 정상 보행을 지속하지 못하는 심신미약 상태가 노출되었을 때, 범행 대상이 되는 경우가 범죄 사례 분석을 통하여 나타나고 있다. 본 연구에서는 옥외활동에서 감지할 수 있는 개인의 상태 추정 방안을 제안한다. 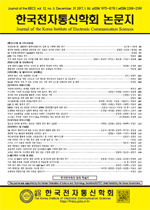 센서와 센서의 이벤트 정보전송을 위하여 별도의 단말기를 장착하는 불편을 피하기 위하여 스마트폰에 내장되어 있는 3축 가속도 센서를 이용하여 비정상적인 상태를 추정할 수 있는데, 3축 가속도를 통하여 측정한 각 축으로의 운동량을 산출하고 시간의 흐름에 따라 분석함으로써 사용자의 상태를 추정할 수 있다. 시간의 흐름을 일정한 간격으로 구분하고 각 시간대역에서의 활동 패턴을 인지하고 정상과 비정상을 구분할 수 있다. 본 연구에서는 비정상 상태를 구분하기 위하여 가속도 센서의 각 방향으로의 운동량과 운동에너지 총량을 계산한 것과 에너지 총량을 푸리에 변환한 값을 비교하여 평가하였다. Various attempts have been made to prevent crime risk. One of the cases where outdoor pedestrians are attacked by criminals is the abnormal health condition. When a mental or mental condition that can not sustain normal walking due to drunkenness is exposed, the case of being a crime is revealed through crime case analysis. In this study, we propose a method for estimating the state of an individual that can be detected in outdoor activities. In order to avoid the inconvenience of installing a separate terminal for event information transmission of sensors and sensors, it is possible to estimate an abnormal state by using a 3-axis acceleration sensor built in a smart phone. The state of the user can be estimated by analyzing the momentum of the user and analyzing it with the passage of time. It is possible to distinguish the flow of time at regular intervals, to recognize the activity patterns in each time band, and to distinguish between normal and abnormal. In this study, we have evaluated the total amount of kinetic energy and kinetic energy in each direction of the acceleration sensor and the Fourier transformed value of the total energy amount to distinguish the abnormal state.